Innovation and leadership are two topics in management which have received so much attention from “gurus” that it is hard to say anything new on these subjects. I rarely read articles on these subjects as they tend to suffer from the “old wine in new bottles” curse. Yet, both topics remain vitally important for building successful organizations. This week, I would like to connect some of my previous writings on innovation in order to draw the distinction between incremental and radical innovation in the context of new products. But you have been warned, do not expect anything new. New products can span a spectrum from incremental to radical. Incremental innovation delivers a small improvement over existing products (e.g., a new flavour of coffee, new model of car) while radical innovation generally brings new functionalities (e.g., Nespresso, hybrid card like Toyota Prius) to the market. Existing incumbent firms excel at incremental innovation while new firms generally bring radical innovation to the market. As I noted in my Marketing as Strategy book, although new entrepreneurial firms can single-mindedly pursue a make-or-break radical innovations, most established firms have too many obligations to chase only radical innovations. Much of the new product development efforts of incumbent firms has to be devoted to incrementally improving their existing products and services. Japanese firms, such as Toyota, have used this continuous improvement strategy to redefine markets which demonstrates that if pursued relentlessly, incremental innovation can also be a game changer. In the normal new development process, if radical projects have to compete with incremental projects for corporate resources, the former always lose. When compared to radical products, it is much easier to show that there is a market for incremental products and that they are also technologically feasible. Nevertheless, top management must find some space and resources for radical innovation via a portfolio approach. Ideally, one does this by making two pots of resources dedicated to the two types of innovation which allows radical projects to compete with other radical projects, rather than versus incremental projects. How a company balances incremental with radical innovation in the company’s portfolio depends on the thrust of the new product development strategy. Company cultures that are more risk averse ultimately drive innovation through a practice of continuous improvement and steady progress, and as a consequence are more consistent in meeting their goals. Cultures that are less risk averse tend to target major gains in big, bold steps. They do not always succeed, but when they do, the impact is significant. While incumbent firms need to be ambidextrous, capable of simultaneously managing incremental as well as radical innovation, the problem is that the two types of innovation require very different supporting cultures (see Table 1). 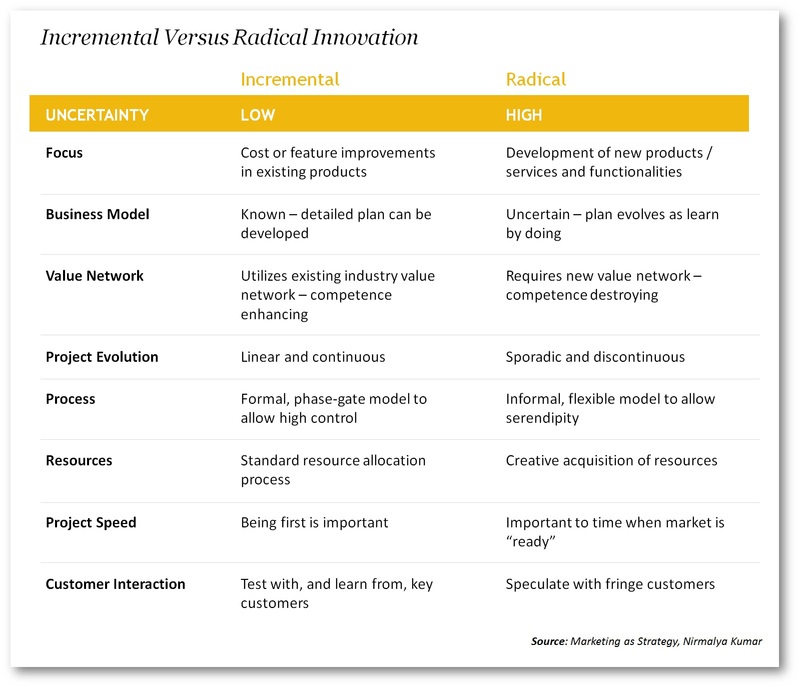 There is not enough space here to elaborate on the Table, but I would like to bring up two aspects of managing incremental versus radical new products. Market research is something that all marketing people swear by. However, it is useful to remember that market research is an imperfect tool that projects what would happen when the new product is launched in the market place. It is a simulation of the market place regardless of whether one employs surveys, interviews, or more technical approaches such as conjoint analysis. It is not the market place. For new products, one may use one of two strategies to test the new product. First, extensive market research to perfect the product and its marketing mix prior to launch or what I call “test and launch”. Alternatively, one may simply launch the product and see how it does in the market to learn what improvements are necessary or what I call “launch and learn”. The point is that market research or the test and launch strategy is more likely to be appropriate when dealing with incremental new products and services. For incremental products, consumers are familiar with relatively similar existing products, and can therefore, make an accurate evaluation of the proposed new product as well as propose improvements. With radical new products, the challenge of obtaining market acceptance to an unfamiliar concept requires customer education. As a result, it is better to launch and learn with a minimum viable product. The digital industry does this rather well. As pointed out in my Private Label Strategy book, co-authored with Professor Steenkamp, multinational companies increasingly introduce new products in multiple countries. The firm can follow a waterfall strategy in that the new product is sequentially introduced in one country after another. Alternatively, the firm can introduce the new product in multiple markets simultaneously—referred to as sprinkler strategy. Our research demonstrated that a sequential, waterfall rollout strategy is most effective for radical new products, while the simultaneous, sprinkler strategy is most effective for incremental new products. For radical new products, getting the marketing strategy right is difficult, and the brand manufacturer learns from failures in the initial country or countries for subsequent countries. On the other hand, it is much less challenging to develop an effective marketing strategy for incremental innovations, while there is a greater danger that success in other countries will be preempted by fast imitation by other brand manufacturers or retailers. Spotting developments in the market and fast copying of innovations is a specialty of dedicated private label suppliers and retailers with strong private label programs. If a waterfall strategy is more effective for radical innovations, with which country should we start? Empirical research suggests that radical innovations should be introduced in countries with a relatively high proportion of innovative consumers. Within Europe, this means that of the major countries, the United Kingdom is the most suitable country in which to commence a sequential rollout strategy for major new product introductions. In the U.K., the segment of innovators is 24 percent, compared with only 15 percent in France and 9 percent in Spain. In fact, research demonstrates that among all large European countries, the U.K. is the only country that is not hurt by the fact that the product has not been introduced elsewhere. From a global point of view, the U.S. is a prime candidate in which to introduce radical new products. On average, its population is among the most responsive to innovations in the world. I guess with Test and Learn as well as Launch and Learn, there has to be a high level of committment and orientation to the customer. If Launch and Learn is fraught with too many learnings, the customer may not give a second chance, which is where radical innovations may face risk and probably give the prize away to the next innovator in line who does an incremental on it. I wonder if that’s why the MySpaces of the world failed where the Facebooks succeeded!